Perhaps the only way to do sponsored content is to go as big as possible. 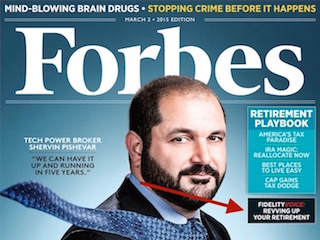 That’s exactly what Forbes has done by placing a native ad on its latest cover. Forbes isn’t the first magazine to take this route. Last May, Time featured Verizon ads on its cover, which prompted us to throw our hands up and shout expletives. The Forbes sponsored ad makes us just as angry, but for a slightly different reason. The ad — for an infographic from Fidelity — was part of a larger buy that also includes digital ads. But get this — the cover tease didn’t come at a premium. It was thrown in as a byproduct of the deal! Mark Howard, Forbes’ chief revenue officer, explained this brilliant idea by telling Ad Age it was “appropriate for Fidelity to be called out on the cover just like any other great piece of content would be.” Typing that sentence felt gross. Look. FishbowlNY hates the idea of ads taking over magazine covers, but we get that it might be inevitable. However, if you’re going to sell your soul, at least charge a little extra for it.